Last week three BIOS scientists – Tim Noyes and Dr. Eric Hochberg in the Coral Reef Ecology and Optics Lab [CREOL] and Andrew Collins in the Bermuda Ocean Acidification and Coral Reef Investigation [BEACON] Lab – presented their research at the 12th International Coral Reef Symposium [ICRS] in Cairns, Queensland, Australia. Held every four years, the ICRS brings together scientists, resource managers, students, and educators from more than 80 countries to present their research and discuss globally relevant topics including reef conservation/management and the impacts of climate change on reef health, in addition to more focused topics like coral reef genomics, reef biogeochemistry, and technologies for coral reef science. Tim Noyes [with Dr. Hochberg as co-author] presented results of fieldwork conducted for the US Navy at Guantanamo Bay, Cuba on temporal habitat utilization patterns of reef fishes. In a separate session, Dr. Hochberg presented his research on the optical indices for coral pigments and reef community light-use efficiency. Andrew Collins presented on work conducted with BIOS scientists Drs.Samantha de Putron, Andreas Andersson (adjunct, currently at Scripps Institution of Oceanography), and Nicholas Bates on the relationship between coral calcification and carbon dioxide. 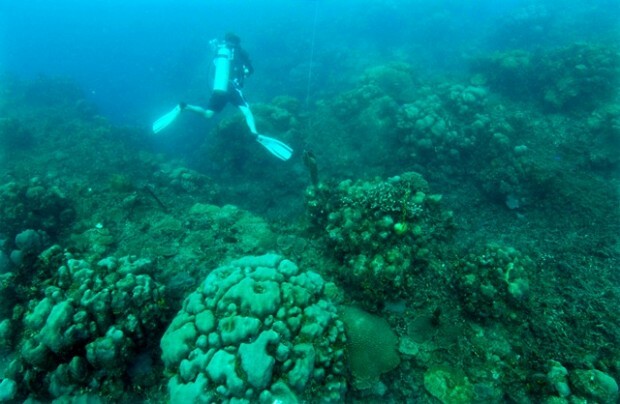 Dr. Hochberg observed that, while the prevailing views at the conference tended to focus on the negative impacts observed on reefs, there was “an undercurrent of optimism that some human behaviors can be altered and thus relieve a bit of the stress” on coral reef ecosystems. For more information on the International Coral Reef Symposium, including the full scientific program and consensus statement, visit www.icrs2012.com.